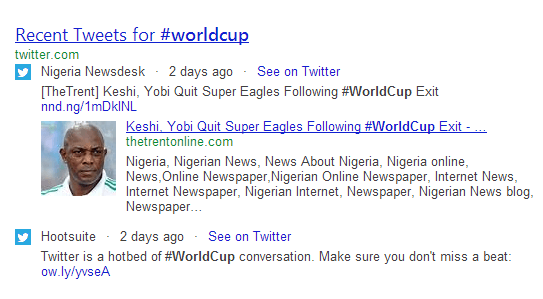 Bing recently started showing more twitter content in search results. Because of an exclusive partnership between Bing and Twitter, you can now perform hashtag searches to find trending topics on the Twitter, as well as search for specific Twitter handles and celebrity-related tweets. According to Bing, they base their inclusion of Twitter content on multiple variables, including a tweet’s quality, retweet count, how recent a tweet was posted. They also take into account the user who posted it and whether or not they are verified.